Berlin 1920 Two babies are born. Two brothers . United and indivisible, sharing everything. Twins in all but blood. As Germany marches into its Nazi Armageddon, the ties of family, friendship and love are tested to the very limits of endurance. And the brothers are faced with an unimaginable choice...Which one of them will survive? Ben Elton's most personal novel to date, Two Brothers transports the reader to the time of history's darkest hour. This was the first book I read on my Kindle :) And I am loving it! 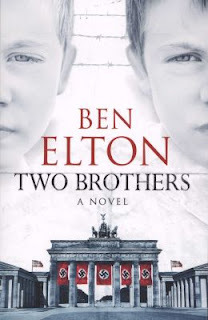 I have loved some of Ben Elton's books and found some of them dismal ... this didn't feel like his usual sort of book, but I enjoyed it. It's a fascinating idea and was well written. I think it also brought forward some dreadfully cringe-worthy moments in the treatment of Jews in Germany at that time, in simple day-to-day life which usually are glossed over for the more traumatic holocaust experiences, I guess.